Recently bought a 2003 Mazda B-2300 for a 4th vehicle. I can tell you after spending many years with Mercedes and BMW's, that Walmart's Mobil 1 0W-40 (Euro Formula) is the best oil for $5 bucks a quart. Getting really, really, deep into the spec's; that oil is a STEAL at $5/qrt. Avoid any oil that states: Greater MPG's, "Green", "Longer Lasting", etc., It is marketing hype with "MPG's" and "Green" being the WORST for your engine. I'm new to this forum, but I am a detailed person, and I use Mobil 1 0W-40 in our Lexus, BMW, Infiniti, and Mazda B-2300. This decision is not based in marketing hype but actual data. NOTHING approaches Walmarts, Mobil 1, 0W-40 (Euro Formula), in the $5/quart category. As a matter of a fact, it's a better oil than many of the boutique brands like "Royal Purple", and others.that cost $9/qrt+. Sam Walton must be turning in his grave with Walmart's price on this oil. "Oil" is one of those topics that gets beat to death whether its a Ford Ranger or Aston Martin forum. BMW goes 15K on oil changes! Yes, 15k They use Mahle Oil Filters as OEM (Available for Ford Rangers) and a Euro Formula of Castrol Oil that is not available in the USA. But! Mobil 1 0W-40 Euro Formula exceeds the BMW spec and is used by Aston Martin. It's crazy that you can buy it at your local Walmart for around $5 a quart. Like you, my garage is stocked with the stuff and I use it on 4 vehicles.without question. My change is done at 5K with the Mobil 1 and Mahle or Bosch Distance Plus oil filters. I've always believed Oil is oil, but I used to drive a '96 Bronco with a 351w. it doesn't really care. However filters make a difference. I ONLY run Purolator on the diesels and motorcraft on the gassers. As far as oil, we buy Advance brand oil by the case. I was using motorcraft full synthetic for a while in my 99' then i switched to mobil 1 full syn. because the extreme cold I get up at school and I'm now switching to Amsoil for my next oil change which alot of people I know swear by for the -50 degree weather we get for over half year. I used to run valvoline regular 5w-30 in everything then one day i bought some regular Castrol GTX cause it was less and i actually think the engine is quieter. Strange, might have to switch! My old 4.0 before my engine swap was every 10k miles new mobile 1 filter and mobile 1 oil. My now 5.4L DOHC built engine... runs valvoline cheap stuff, might switch to Castrol next though. No more synthetics for me. Stay with the older spec'd OILS as the newer specs are designed to meet newer emissions standards, there is an inverse relationship between engine protection and MPG's / environmental concerns. Go with "ESP" if you want more MPG's (Greener alternative) over better engine wear protection which is found in oils with high levels of ZDDP. Lower engine protection equals more MPG's. Why? Because mass (zinc,(ZDDP) equals protective film that "slightly" lowers your MPG's but mostly the "Green Party" people do not want zinc in the oils but that's what protects them. The antiwear additive ZDDP (Zinc DialkylDithioPhosphate) activates as it decomposes at hot metal surfaces and forms a glass-like protective layer on the metallic surface. The active ingredient phosphorus which is added through a component called ZDDP. If you prefer a product with a higher level of anti-wear performance, there are a number of Mobil 1 synthetic oils that have higher levels of phosphorus. 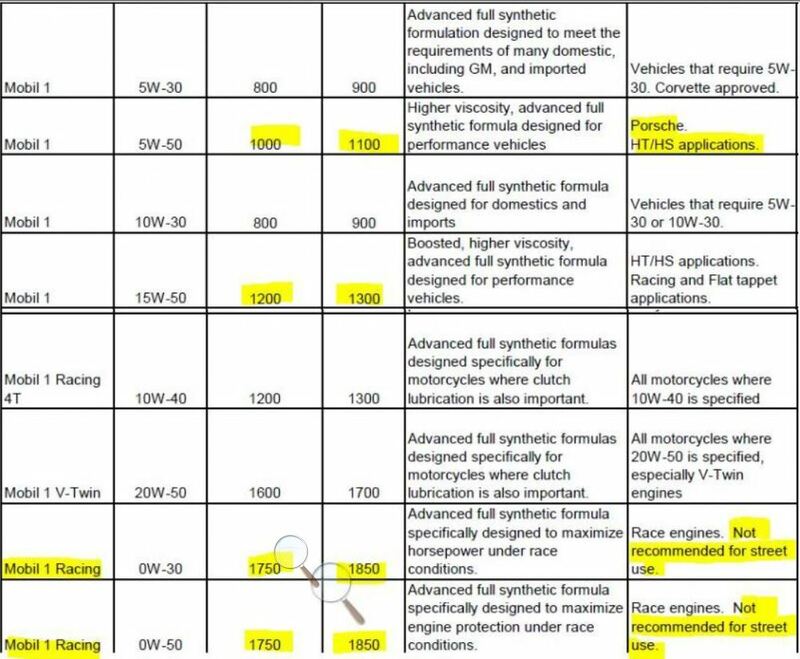 Remember that BMW LL-01 requires HTHS to be above 3.5. Most synthetic oils today fall well below that requirement. Mobil 1 0W-40's HTHS is 3.8 so it is a great buy at $24.95/jug. This test is a simulation of the shearing effects that would occur within an engine. In fact, it's actually designed to simulate motor oil viscosity in operating crankshaft bearings. Under high stress conditions where shearing can occur, the VI Improvers (polymers) break down. As they do, the viscosity of the oil decreases. This is what the High Temperature/High Shear test checks for. The HT/HS test is measured in Centipoise (cP) as the Cold Crank Simulator test is. However, in this case, because you're hoping for the least loss of viscosity with an increase in heat and stress, you want the cP value to remain high. HTHS is a balance between fuel economy and protection. Too high of an HTHS and you lower fuel economy, too low, and you reduce wear protection. A critical issue for the oil industry is how misapplication of low HTHS viscosity oils will be avoided. The use of low HTHS oils will save fuel in engines designed for their use but could lead to excessive premature wear in some engines. So, if you're trying to squeeze every mile out of your gallon of gas, then go with a sub 3.5 HTHS oil, if you're most concerned about wear on the internal components, then seek out an oil with >3.5 HTHS. Why offer <3.5 HTHS oils? The drivers behind lowering HTHS viscosity are new global governmental regulations to improve fuel economy (FE) and lower greenhouse gases (GHG) in new vehicles. Lower HTHS viscosity tends to improve FE and lower GHG but higher HTHS viscosity affords better wear protection so a careful balance must be found when formulating an engine oil. Avoid any oil with the FE designation "Fuel Economy" on the packaging. So we know to look for motor oil that is > 3.5 HTHS. So, folks, I am telling you, that Mobil 1, 0W-40, at Walmart for $24.97, 5 quart jug, is highway robbery. It might (slightly) rob you of some MPG's, but, come on! We're trying to save that $18,000 motor from unnecessary wear; aren't we? The viscosity of a fluid is a measure of its resistance to gradual deformation by shear stress or tensile stress. For liquids, it corresponds to the informal notion of "thickness". For example, honey has a higher viscosity than water. I am in favor of engine bearing protection over MPG's. With Mobil 1 0W-40, you have a lot of oil "thickness" between surfaces at high temp's. I vote "yes" for that! Stock up for ALL of your vehicles at this price. I certainly have! Worried about Cold Starts? 0W-40 has a pour rating of -45 degrees celsius. So you are covered on those cold Northern nights. Viscosity of Mobil 1 0W-40 = 14.2 at 212 Fahrenheit while (BMW requires 12.3). 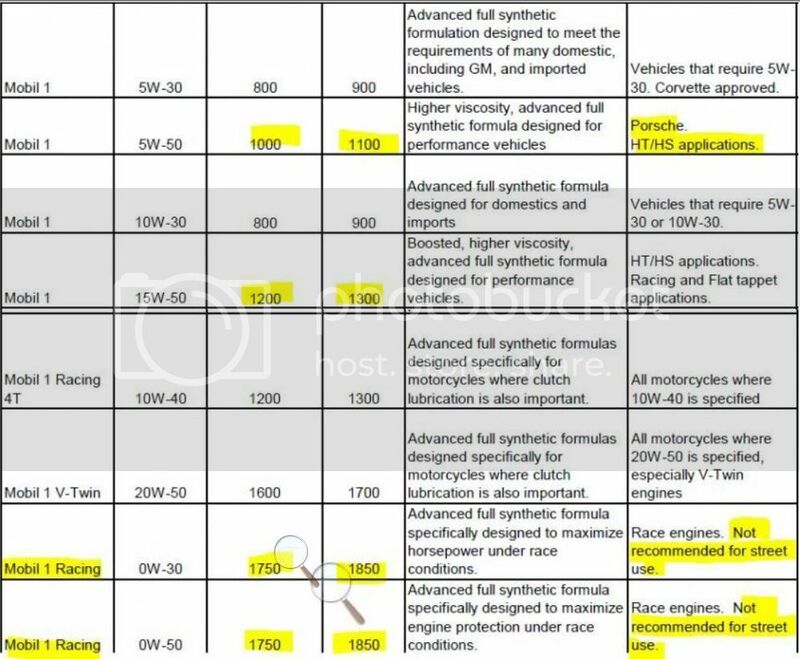 In other words, Mobil 1, 0W-40, kicks axx on BMW's LL-01 spec's. Now take this data, and compare to your favorite Castrol oil blend/mix/packaging. Go to their (Castrol's, etc) web site and review their MSDS data sheet on the specific oil you are contemplating. Castrol EDGE 0W-40 A3/B4: 13.3 cSt " "
What a difference in viscosity across the oils. From a very thin 9.6, to a heavy 14.1 cSt. But on the shelf, they all look good. Total QUARTZ 9000 5W-40: 13.6 cSt, HTHS ? Total QUARTZ ENERGY 9000 0W30: 12.18 cSt, HTHS ? Total QUARTZ RACING 10W-50 17 cSt, HTHS ? I do not work for Exxon/Mobil nor Walmart, but every once in awhile, they offer incredible bargains to the public. Mobil 1, 0W-40, is such a bargain. I've always used Valvoline in every vehicle I've owned. I currently run Shell Rotella T6 in my 6.0 just because I got tired of not being able to find the full synthetic Valvoline diesel engine oil. If the Valvoline wasn't so hard to find I'd definitely still be running it. Good god that is a lot of info. What's your source for it all? I can't get over the money issue in oil...l know I'll probably never get 200,000 miles on anything I own cause I don't want to have anything with that many miles on it. Resale value doesn't come to my mind at all when I've gone through 5 sets of tires. 8 sets of brakes and maybe the thousands or so dollars in the other thing we know it takes to keep a car running for over 200,000 or so miles. Like I said , just turned 50,000 on mine and my last tank to tank fill up on the highway was 28.9 mpg. But last year I noticed the door sills were starting to rust between the drain holes. Some guys have poured or sprayed oil in the holes to protect the inside of the door. I wish I did. I need a new passenger side. Amsoil for specialty oils, or if you plan on owning your vehicle until it dies. I use to hate Amsoil then started using it on a fleet of 100+ Crown Vic police cars with insane idle times. I'm sold. Previous BMW posts on the topic of "oil". Mostly from MSDS spec sheets by oil brand. 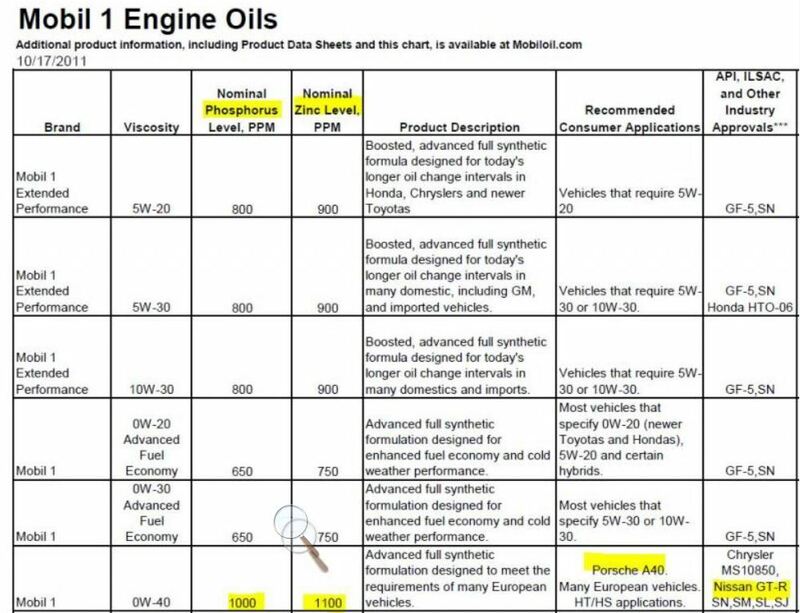 And after all of that "data"; Mobil 1 0W-40 Euro Formula from Walmart is bare-none, the best deal, and one of the best performing oils on the market. But only that one. You get into other Mobil 1 oils, and they're no better than anyone else and often cost more. Newer spec'd oils DO NOT offer more protection but actually less. That's because they cut down on the ZDDP additive in order to meet environmental concerns over engine protection. So: "MPG" "Extended Performance" "Green" are all labels to avoid. When you review the Mobil Oil chart you'll notice that "Advanced Fuel Economy" offers the least amount of engine protection. Almost 1/3 of what the 0W-40 Euro formula offers. We often think that: "Newer is better" but not with motor oil. US and international environmental mandates are forcing oil companies to reduce/cut the level of engine protection (ZDDP) in order to save the planet. Perhaps with an engine built since 2010 or so, you can safely use lower ZDDP level oils, (but I seriously doubt that is true). Coincidently, there is ZERO evidence that higher levels of ZDDP is harming the environment (I recycle all of my oil), but the Green Movement and "Global Warming" (oops: I mean Climate Change) has political power and they are setting the standards. So, stock up on Mobil 1, 0W-40 Euro while it lasts. Because it will not last! It WILL be pulled from the shelves at some point or Mobil will be forced to re-spec into a "Greener" alternative. so 0-40w is ok to run in our engines? My main concern is with ZDDP levels over emissions and environmental concerns. 5W-20 has much lower ZDDP in order to meet emissions and environmental standards. If your vehicle is under warranty, then CYA and stay with 5W-20. •Your vehicle was designed to operate efficiently on the 5W-20 grade and internal engine hydraulics are optimized around this viscosity grade. •Mobil 1 5W-20 and Mobil 1 5W-30 are ILSAC GF-5 synthetic oils, which means they will provide fuel economy and emission system protection benefits which will maximize your fuel economy and potentially extend the life of your catalytic converter/oxygen sensors. You will have CYA answers from all oil manufacturers. And it all has to do with the level of ZDDP in the oil. My 2003 B2300 will run on 0W-40 until Mobil 1 is forced to reduce the ZDDP levels at which time I'll find the next best alternative. I know that BMW Indy shops have no issues with using Mobil 1 0W-40 over BMW's 5W-30 spec'd oil. •Provides exceptional cleaning power for dirty engines. Last edited by GMG; 09-15-2013 at 04:12 PM. It's a bit insane that Walmart carries one of the best motor oils in the world; but, they do! I own 4 vehicles, so I've stocked up on Mobil 1 0W-40 Euro for all of them. "Why in the hell are you selling that oil so cheap?" "Why in the hell is Mobil 1 0W-40 Euro allowed to have so much ZDDP in it?" Too much thought on oil.... Use the proper weight specified in owners manual with correct certifications and it will last longer than the frame will. Or your just unlucky and got a lemon.... I have used almost every brand around since the late 80s except your high dollar amsoil or royal purple stuff and never suffered engine failure from oil. I do use valvoline and Pennzoil products most often unless I catch a good deal on any other shelf brand oil with no problems. I average less than 10ooo miles a year on our three vehicles so if I'm using full synthetic oil its a yearly oci if its syn blend or full dino its twice yearly. I am not concerned of warranty issues as well, lab analysis are done and all is working properly. Proper weight and Ali certs and I'm good. BITOG is far surpassed by other forums although they have good general info on many fluids. But oil is certainly not oil as it is a highly market segmented product line. I'm not a fan of marketing. I do however trust the science of lubrication related products. BITOG was just a suggestion, and as stated, a good starting point for many. I try not to overthink it with oil brands, types, etc. So long as it meets the criteria of what is recommended by the vehicle manufacturer, I'm content. There are far worse things that usually go wrong before the oil fails to do its job. But I change my own oil/filter in 4 different vehicles on the weekend. Car mfg'r are FORCED, by a central government, to meet one of their CURRENT (Political party) requirements. ZDDP is opposed by Democrats (Environmentalists), and they currently hold power. HTHS and ZDDP are the parameters to measure oil by. Therefore, Ford, GM (Government Motors), Chrysler, etc., do not have the freedom to focus on "performance" over all other factors. They MUST follow CURRENT gov't standards, That is NOT always in your best interest. Ford does not operate independently of Barack Obama. If the Senate and Obama sign new "Green" legislation, then Ford must oblige. That obligation has nothing to do with actual performance. That is why the latest and greatest "oil designation" SN; is not in your best interest and the best bang for your buck. SN has lower ZDDP in order to meet 2013 environmental standards. if youre rings are in good shape and youre not "burning oil" as you drive, then i see no worries over damaging a catalytic converter or a oxgen sensor. hexk id run straght 30 wt if it was best for the motor, i realize its not, but i would.....could care less about the cat, gutted mine about 5 years back, heck sometimes i'll put old oil in the exhaust system and fill the muffler, fogging for mosquitos in the morning drive to work.....enviroment?....hell, we'll be dead long before the enviroment is destroyed. 174k, is it worth switching to synthetic oils? Any differences in synthetic oils?? ?